A couple of recent articles covered ground related to clouds, but under Models –Models, On – and Off – the Catwalk – Part Seven – Resolution & Convection & Part Five – More on Tuning & the Magic Behind the Scenes. In the first article Andrew Dessler, day job climate scientist, made a few comments and in one comment provided some great recent references. One of these was by Paulo Ceppi and colleagues published this year and freely accessible. Another paper with some complementary explanations is from Mark Zelinka and colleagues, also published this year (but behind a paywall). In this article we will take a look at the breakdown these papers provide. There is a lot to the Ceppi paper so we’re not going to review it all in this article, hopefully in a followup article. Note that the cloud radiative effect shown above isn’t feedbacks from warming, it is simply the current effect of clouds. The big question is how this will change with warming. In the next graphic, the inset in the top shows cloud feedback (note 1) vs ECS from 28 GCMs. ECS is the steady state temperature resulting from doubling CO2. 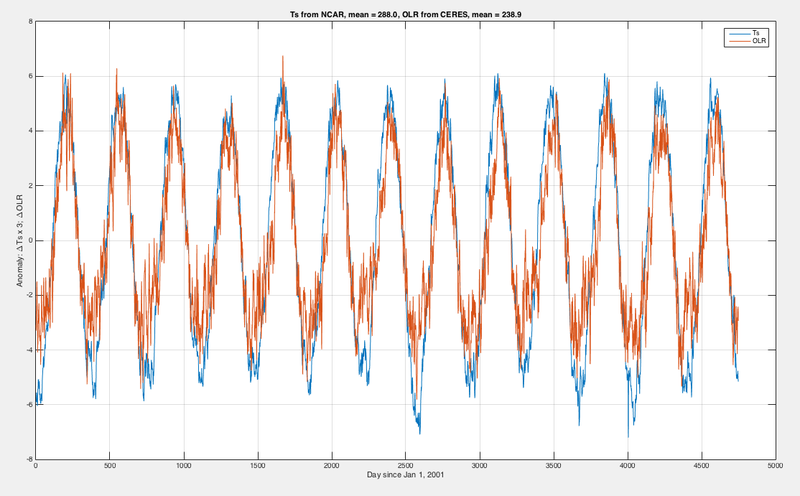 Two models are picked out – red and blue – and in the main graph we see simulated warming under RCP8.5 (an unlikely future world confusing described by many as the “business as usual” scenario). In the bottom graphic, cloud feedbacks from models are decomposed into the effect from low cloud amount, from changing high cloud altitude and from low cloud opacity. We see that the amount of low cloud is the biggest feedback with the widest spread, followed by the changing altitude of high clouds. And both of them have a positive feedback. The gray lines extending out cover the range of model responses. 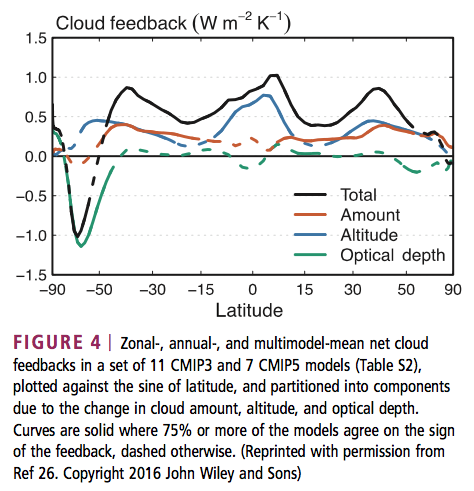 Notably, the high cloud altitude feedback was deemed positive with high confidence due to supporting evidence from theory, observations, and high-resolution models. 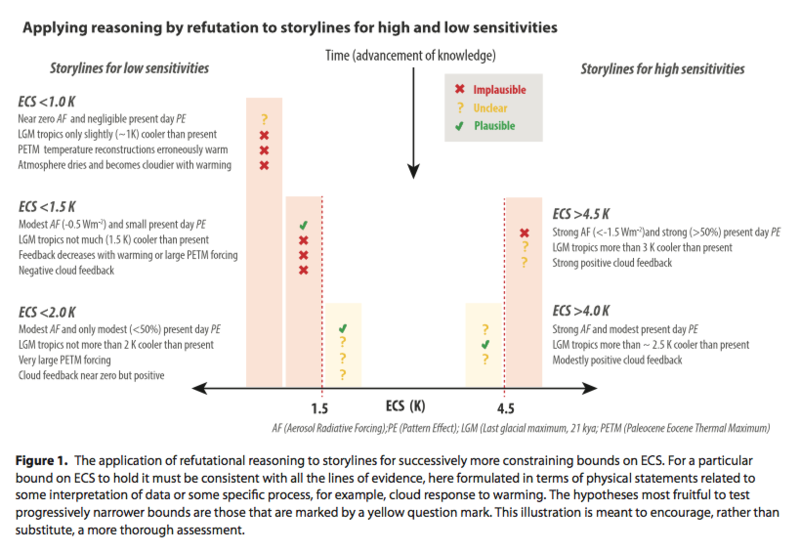 On the other hand, continuing low confidence was expressed in the sign of low cloud feedback because of a lack of strong observational constraints. However, the AR5 authors noted that high-resolution process models also tended to produce positive low cloud cover feedbacks. The cloud opacity feedback was deemed highly uncertain due to the poor representation of cloud phase and microphysics in models, limited observations with which to evaluate models, and lack of physical understanding. The authors noted that no robust mechanisms contribute a negative cloud feedback. In the four years since AR5, evidence has increased that the overall cloud feedback is positive. This includes a number of high-resolution modelling studies of low cloud cover that have illuminated the competing processes that govern changes in low cloud coverage and thickness, and studies that constrain long-term cloud responses using observed short-term sensitivities of clouds to changes in their local environment. Both types of analyses point toward positive low cloud feedbacks. 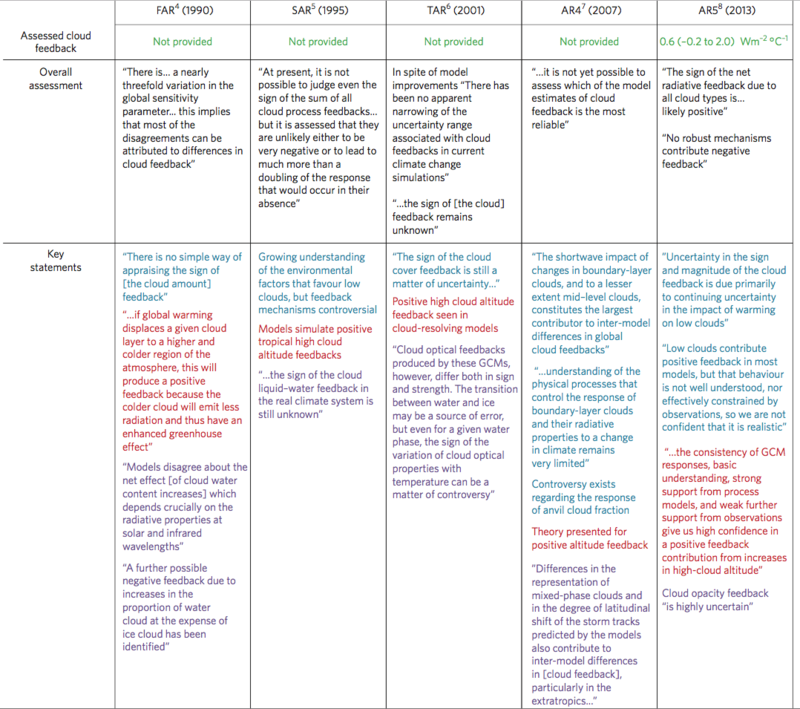 There is currently no evidence for strong negative cloud feedbacks..
Then they break down the cloud feedback further. This graph is well worth understanding. For example, in the second graph (b) we are looking at higher altitude clouds. We see that the increasing altitude of high clouds causes a positive feedback. The red dots are LW (longwave = terrestrial radiation). If high clouds increase in altitude the radiation from these clouds to space is lower because the cloud tops are colder. This is a positive feedback (more warming retained in the climate system). The blue dots are SW (shortwave = solar radiation). If high clouds increase in altitude it has no effect on the reflection of solar radiation – and so the blue dots are on zero. 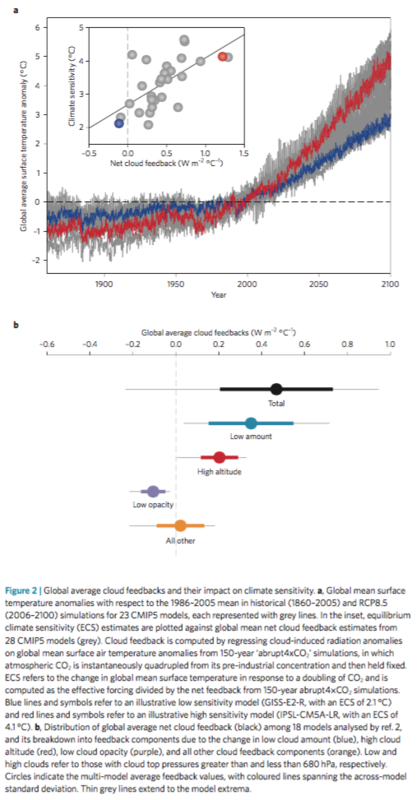 Looking at the low clouds – bottom graph (c) – we see that the feedback is almost all from increasing reflection of solar radiation from increasing amounts of low clouds. And the cloud feedback by latitude broken down into: altitude effects; amount of cloud; and optical depth (higher optical depth primarily increases the reflection to space of solar radiation but also has an effect on terrestrial radiation). 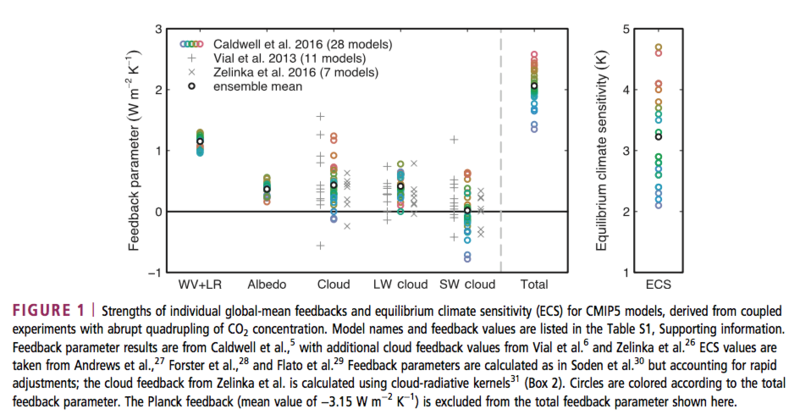 Cloud feedback is the main contributor to intermodel spread in climate sensitivity, ranging from near zero to strongly positive (−0.13 to 1.24 W/m²K) in current climate models. It is a combination of three effects present in nearly all GCMs: rising free- tropospheric clouds (a LW heating effect); decreasing low cloud amount in tropics to midlatitudes (a SW heating effect); and increasing low cloud optical depth at high latitudes (a SW cooling effect). Low cloud amount in tropical subsidence regions dominates the intermodel spread in cloud feedback. Happy Christmas to all Science of Doom readers. Note – if anyone wants to debate the existence of the “greenhouse” effect, please add your comments to Two Basic Foundations or The “Greenhouse” Effect Explained in Simple Terms or any of the other tens of articles on that subject. Comments here on the existence of the “greenhouse” effect will be deleted. The radiative impact of clouds is measured as the cloud-radiative effect (CRE), the difference between clear-sky and all-sky radiative flux at the top of atmosphere. 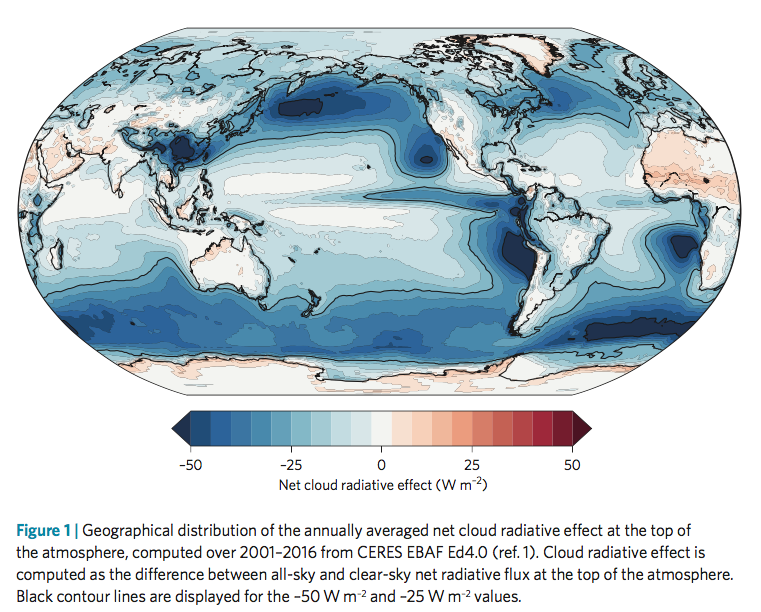 Clouds reflect solar radiation (negative SW CRE, global-mean effect of −45W/m²) and reduce outgoing terrestrial radiation (positive LW CRE, 27W/m²−2), with an overall cooling effect estimated at −18W/m² (numbers from Henderson et al.). CRE is proportional to cloud amount, but is also determined by cloud altitude and optical depth. The magnitude of SW CRE increases with cloud optical depth, and to a much lesser extent with cloud altitude. By contrast, the LW CRE depends primarily on cloud altitude, which determines the difference in emission temperature between clear and cloudy skies, but also increases with optical depth. As the cloud properties change with warming, so does their radiative effect. 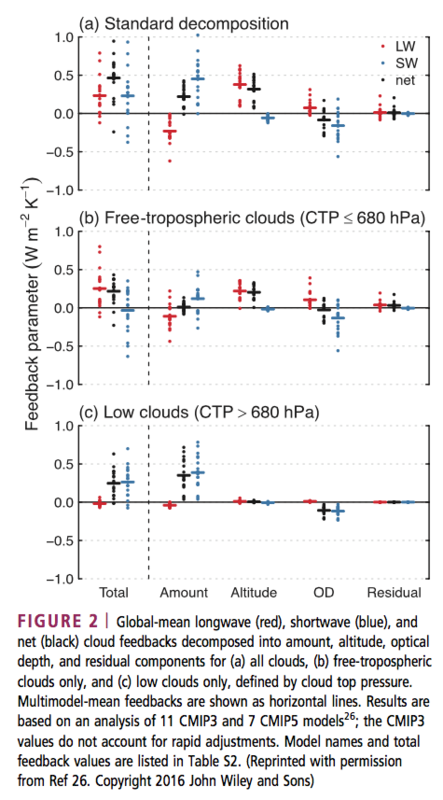 The resulting radiative flux response at the top of atmosphere, normalized by the global-mean surface temperature increase, is known as cloud feedback. This is not strictly equal to the change in CRE with warming, because the CRE also responds to changes in clear-sky radiation—for example, due to changes in surface albedo or water vapor. The CRE response thus underestimates cloud feedback by about 0.3W/m² on average. Cloud feedback is therefore the component of CRE change that is due to changing cloud properties only. 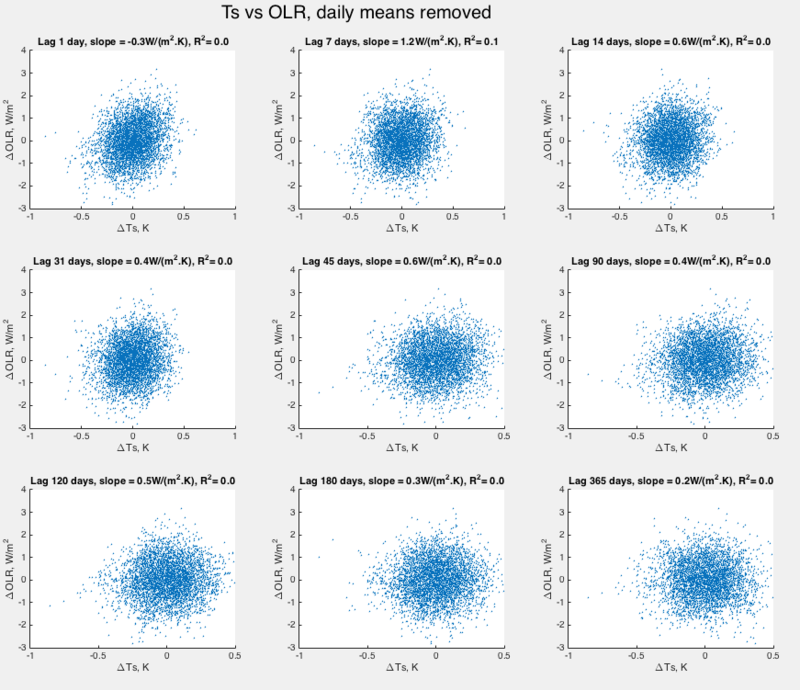 Various methods exist to diagnose cloud feedback from standard GCM output. 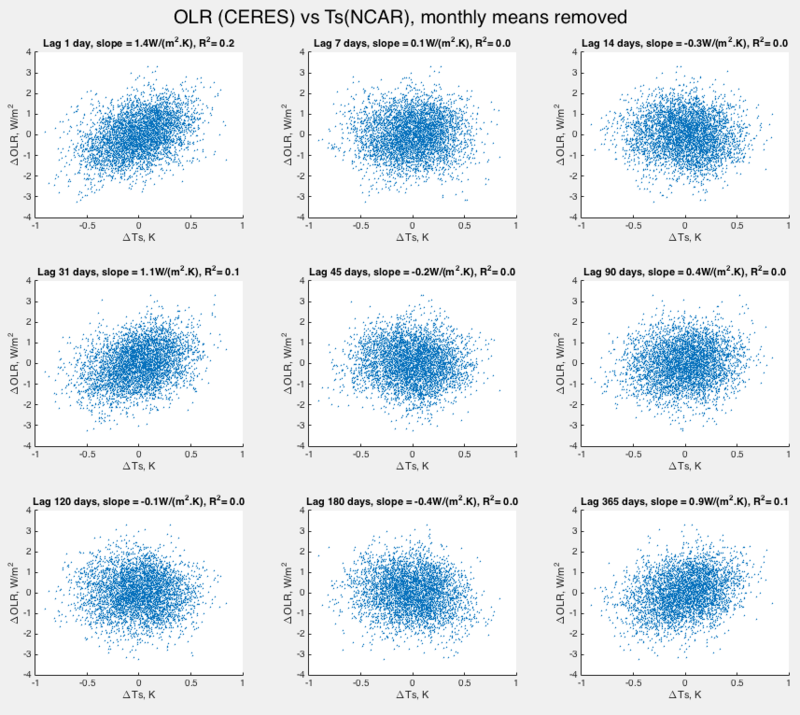 The values presented in this paper are either based on CRE changes corrected for noncloud effects, or estimated directly from changes in cloud properties, for those GCMs providing appropriate cloud output. The most accurate procedure involves running the GCM radiation code offline—replacing instantaneous cloud fields from a control climatology with those from a perturbed climatology, while keeping other fields unchanged—to obtain the radiative perturbation due to changes in clouds. This method is computationally expensive and technically challenging, however. I was re-reading Missing iris effect as a possible cause of muted hydrological change and high climate sensitivity in models, Thorsten Mauritsen and Bjorn Stevens from 2015 (because I referenced it in a recent comment) and then looked up other recent papers citing it. One interesting review paper is by Stevens et al from 2016. I recognized his name from many other papers and it looks like Bjorn Stevens has been publishing papers since the early 1990s, with almost 200 papers in peer-reviewed journals, mostly on this and related topics. Likewise, Sherwood and Bony (two of the coauthors) are very familiar names from this field. Nearly 40 years have passed since the U.S. National Academies issued the “Charney Report.” This landmark assessment popularized the concept of the “equilibrium climate sensitivity” (ECS), the increase of Earth’s globally and annually averaged near surface temperature that would follow a sustained doubling of atmospheric carbon dioxide relative to its preindustrial value. 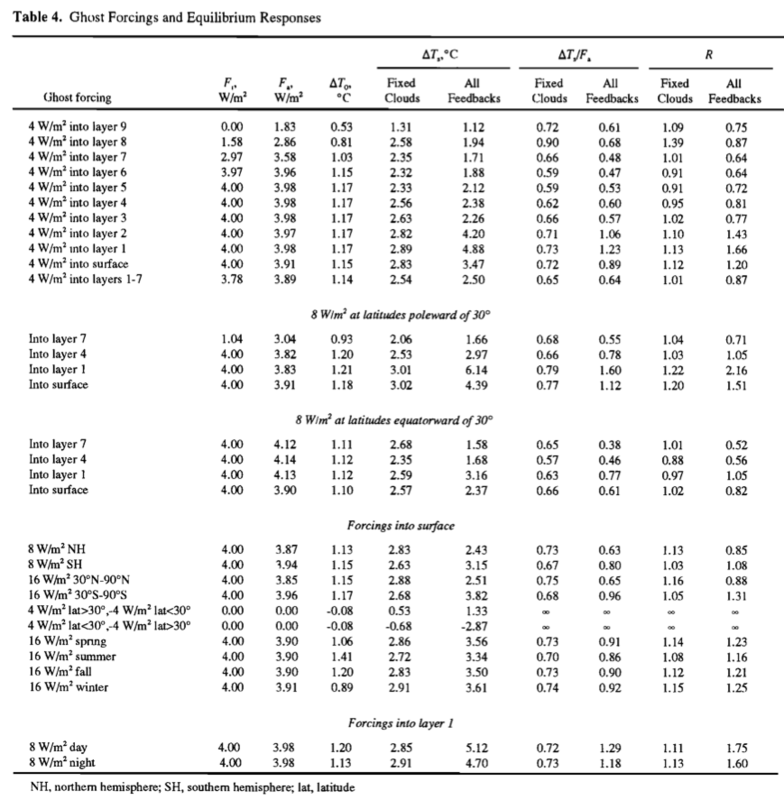 Through the application of physical reasoning applied to the analysis of output from a handful of relatively simple models of the climate system, Jule G. Charney and his co-authors estimated a range of 1.5 –4.5 K for the ECS [Charney et al., 1979]. ECS is an idealized but central measure of climate change, which gives specificity to the more general idea of Earth’s radiative response to warming. This specificity makes ECS something that is easy to grasp, if not to realize. For instance, the high heat capacity and vast carbon stores of the deep ocean mean that a new climate equilibrium would only be fully attained a few millennia after an applied forcing [Held et al., 2010; Winton et al., 2010; Li et al., 2012]; and uncertainties in the carbon cycle make it difficult to know what level of emissions is compatible with a doubling of the atmospheric CO2 concentration in the first place. 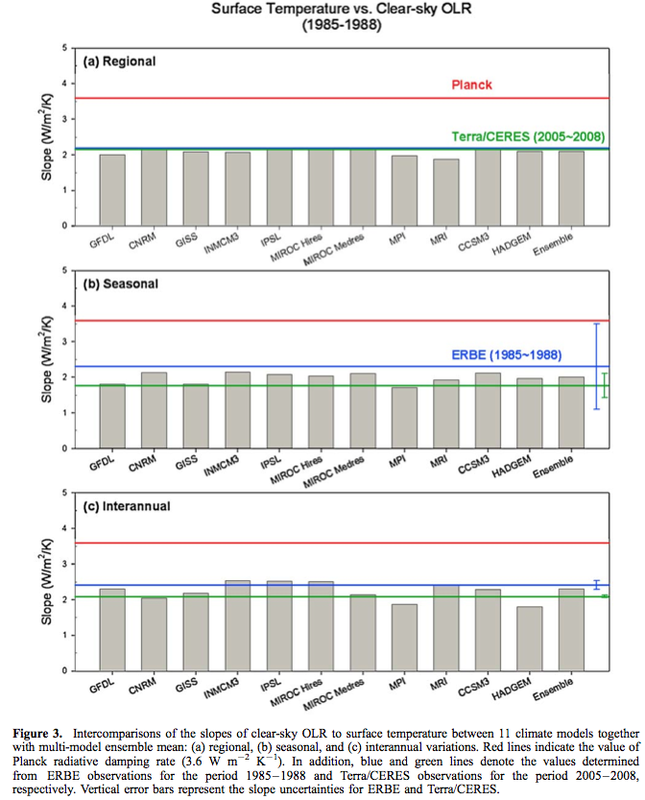 Concepts such as the “transient climate response” or the “transient climate response to cumulative carbon emissions” have been introduced to account for these effects and may be a better index of the warming that will occur within a century or two [Allen and Frame, 2007; Knutti and Hegerl, 2008; Collins et al., 2013;MacDougall, 2016]. But the ECS is strongly related and conceptually simpler, so it endures as the central measure of Earth’s susceptibility to forcing [Flato et al., 2013]. The socioeconomic value of better understanding the ECS is well documented. If the ECS were well below 1.5 K, climate change would be a less serious problem. The stakes are much higher for the upper bound. If the ECS were above 4.5 K, immediate and severe reductions of greenhouse gas emissions would be imperative to avoid dangerous climate changes within a few human generations. From a mitigation point of view, the difference between an ECS of 1.5 K and 4.5 K corresponds to about a factor of two in the allowable CO2 emissions for a given temperature target [Stocker et al., 2013] and it explains why the value of learning more about the ECS has been appraised so highly [Cooke et al., 2013; Neubersch et al., 2014]. The ECS also gains importance because it conditions many other impacts of greenhouse gases, such as regional temperature and rainfall [Bony et al., 2013; Tebaldi and Arblaster, 2014], and even extremes [Seneviratne et al., 2016], knowledge of which is required for developing effective adaptation strategies. Being an important and simple measure of climate change, the ECS is something that climate science should and must be able to better understand and quantify more precisely. 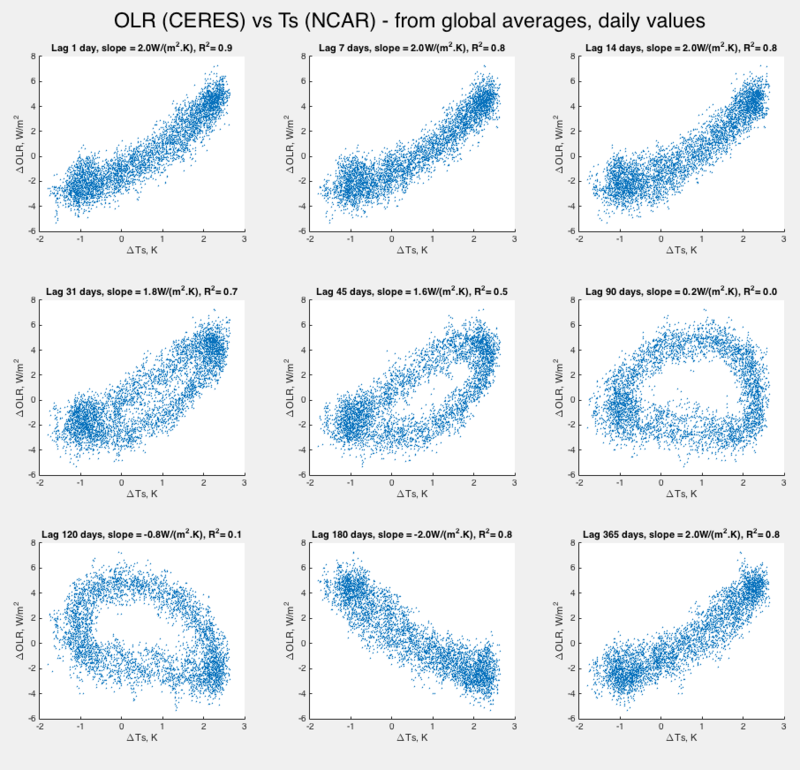 One of the questions they raise is at the heart of my question about whether climate sensitivity is a constant that we can measure, or a value that has some durable meaning rather than being dependent on the actual climate specifics at the time. 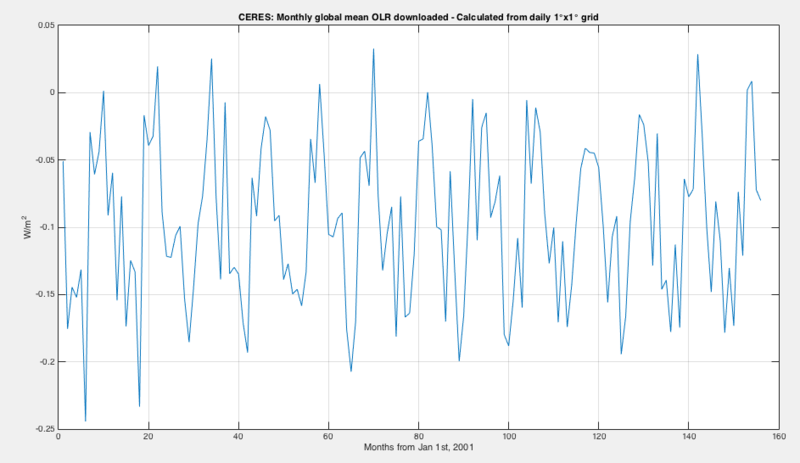 For example, there are attempts to measure it via the climate response during an El Nino. We see the climate warm and we measure how the top of atmosphere radiation balance changes. We attempt to measure the difference in ocean temperature between end of the last ice age and today and deduce climate sensitivity. Perhaps I have a mental picture of non-linear systems that is preventing me from seeing the obvious. However, the picture I have in my head is that the dependence of the top of radiation balance on temperature is not a constant. Hence, a generalization of the concept of climate sensitivity to different eras may need to account for differences that arise from the different base state of the climate system, increasingly so for large perturbations. 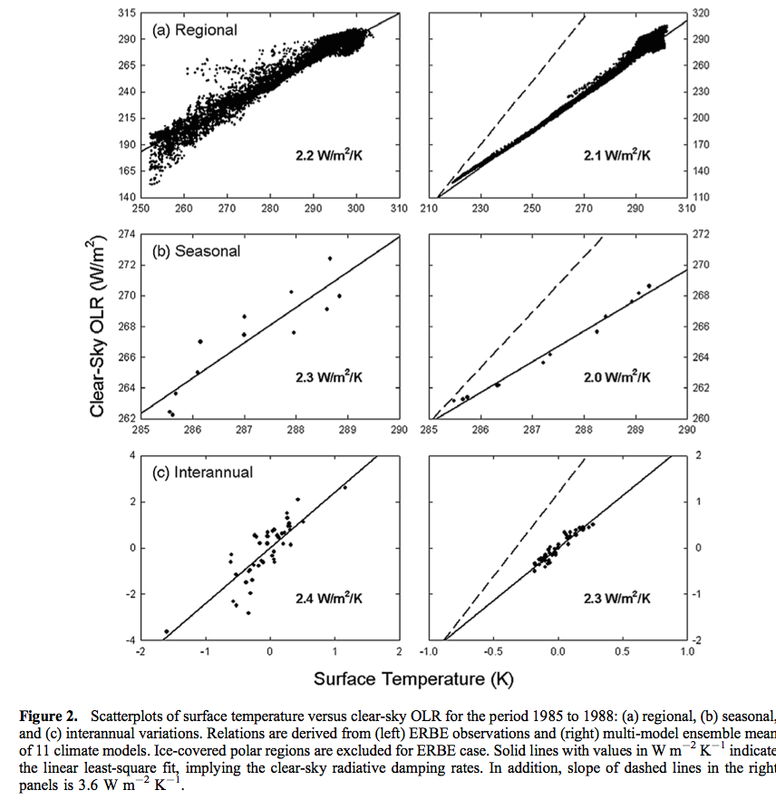 Even for small perturbations, there is mounting evidence that the outward radiation may be sensitive to the geographic pattern of surface temperature changes. 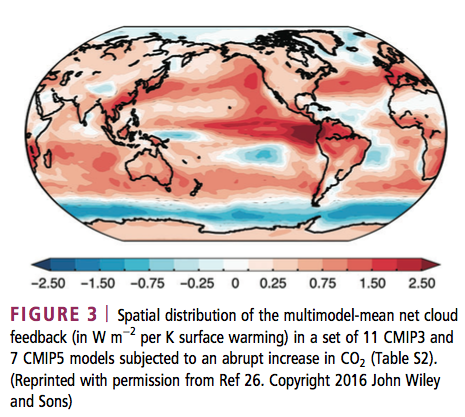 Senior and Mitchell  argued that if warming is greater over land, or at high latitudes, different feedbacks may occur than for the case where the same amount of warming is instead concentrated over tropical oceans. These effects appear to be present in a range of models [Armour et al., 2013; Andrews et al., 2015]. Physically they can be understood because clouds—and their impact on radiation—are sensitive to changes in the atmospheric circulation, which responds to geographic differences in warming [Kang et al., 2013], or simply because an evolving pattern of surface warming weights local responses differently at different times [Armour et al., 2013]. Hence different patterns of warming, occurring on different timescales, may be associated with stronger or weaker radiative responses. This introduces an additional state dependence, one that is not encapsulated by the global mean temperature. We call this a “pattern effect.” Pattern effects are thought to be important for interpreting changes over the instrumental period [Gregory and Andrews, 2016], and may contribute to the state dependence of generalized measures of Earth’s climate sensitivity as inferred from the geological record. Some of my thoughts are that the insoluble questions on this specific topic are also tied into the question about the climate being chaotic vs just weather being chaotic – see for example, Natural Variability and Chaos – Four – The Thirty Year Myth. In that article we look at the convention of defining climate as the average of 30 years of weather and why that “eliminates” chaos, or doesn’t. Non-linear systems have lots of intractable problems – more on that topic in the whole series Natural Variability and Chaos. It’s good to see it being mentioned in this paper. 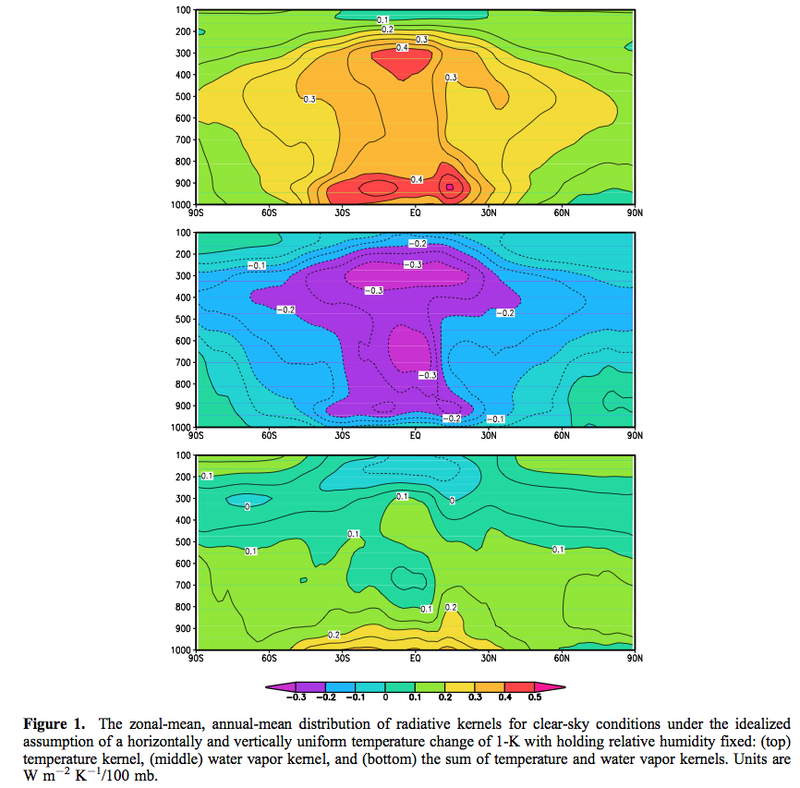 Read the whole paper – it reviews the conditions necessary for very low climate sensitivity and for very high climate sensitivity, with the idea being that if one necessary condition can be ruled out then the very low and/or very high climate sensitivity can be ruled out. The paper also includes some excellent references for further insights. Happy Thanksgiving to our US readers. 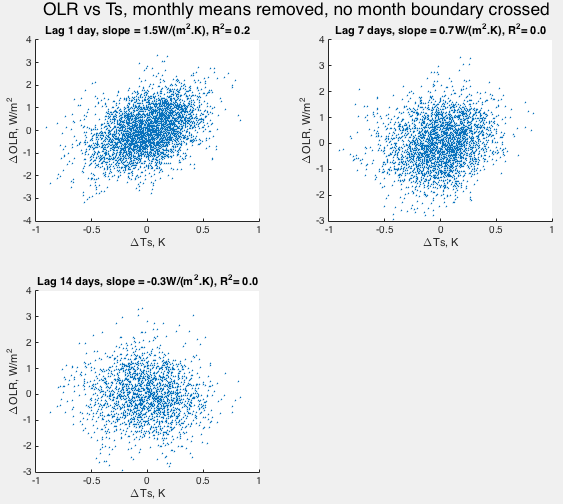 In this article we will look at some results using the Wonderland model. Remember the Wonderland model is not the earth. But the same is also true of “real” GCMs with geographical boundaries that match the earth as we know it. They are not the earth either. All models have limitations. This is easy to understand in principle. It is challenging to understand in the specifics of where the limitations are, even for specialists – and especially for non-specialists. What the Wonderland model provides is a coarse geography with earth-like layout of land and ocean, plus of course, physics that follows the basic equations. And using this model we can get a sense of how radiative forcing is related to temperature changes when the same value of radiative forcing is applied via different mechanisms. 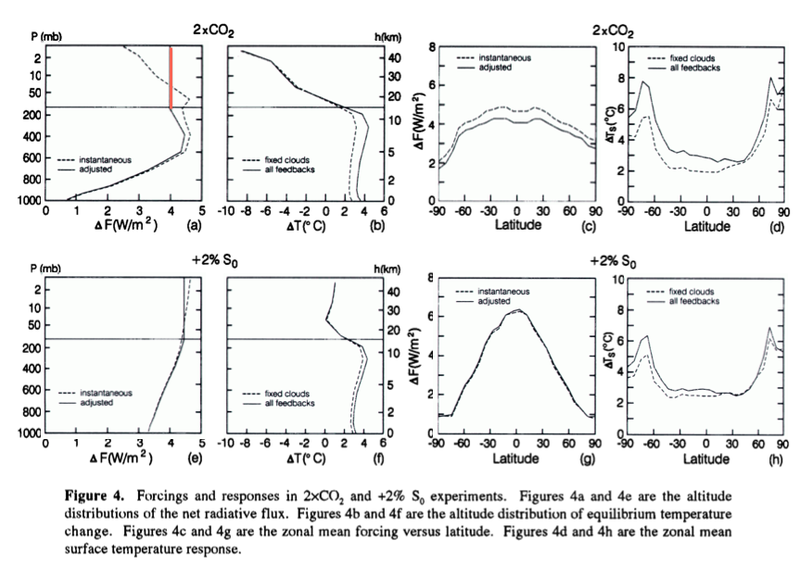 In the 1997 paper I think that Hansen, Sato & Ruedy did a decent job of explaining the limitations of radiative forcing, at least as far as the Wonderland climate model is able to assist us with that understanding. Remember as well that, in general, results we see from GCMs do not use radiative forcing. Instead they calculate from first principles – or parameterized first principles. 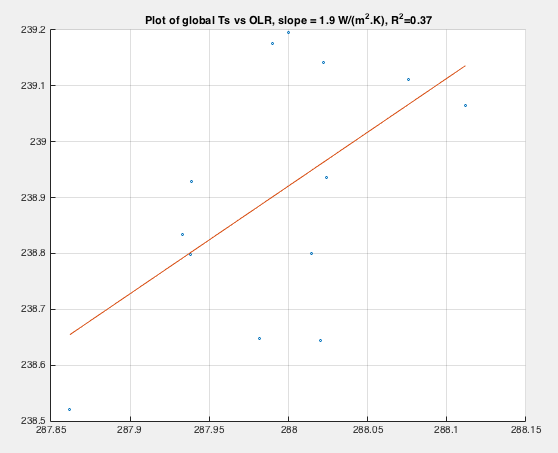 On the top line, the first two graphs are the net flux change, as a function of height and latitude. First left – instantaneous; second left – adjusted. These two cases were explained in the last article. The second left is effectively the “radiative forcing”, and we can see that the above the tropopause (at about 200 mbar) the net flux change with height is constant. This is because the stratosphere has come into radiative balance. Refer to the last article for more explanation. On the right hand side, with all feedbacks from this one change in Wonderland, we can see the famous predicted “tropospheric hot spot” and the cooling of the stratosphere. It’s interesting to see the larger temperature increases predicted near the poles. I’m not sure I really understand the mechanisms driving that. Note that the radiative forcing is generally higher in the tropics and lower at the poles, yet the temperature change is the other way round. 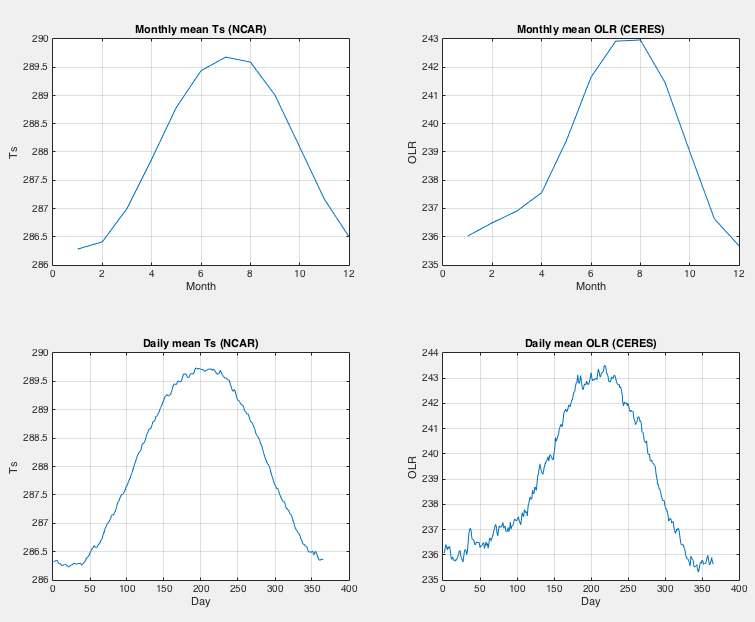 Now let’s take a look at a comparison exercise, increasing solar radiation by 2%. The responses to these comparable global forcings, 2xCO2 & +2% S0, are similar in a gross sense, as found by previous investigators. However, as we show in the sections below, the similarity of the responses is partly accidental, a cancellation of two contrary effects. 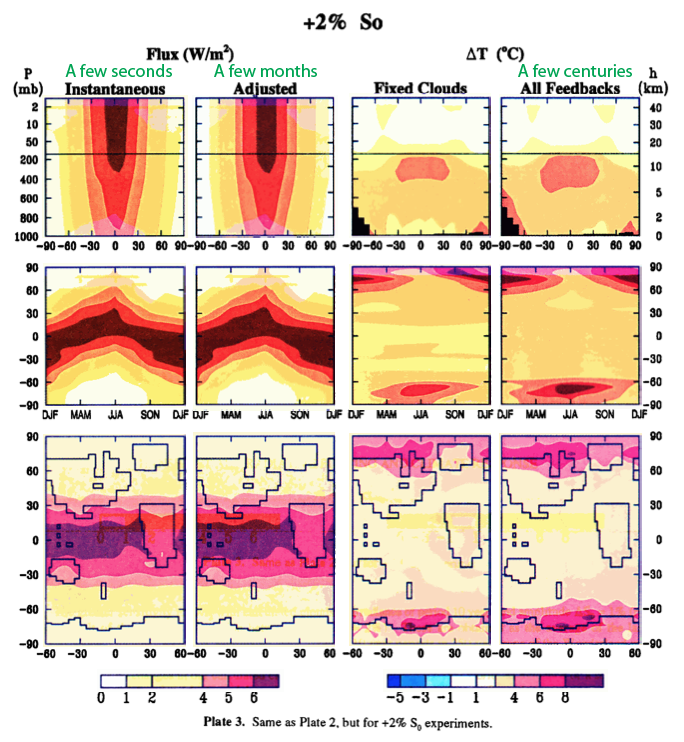 We show in section 5 that the climate model (and presumably the real world) is much more sensitive to a forcing at high latitudes than to a forcing at low latitudes; this tends to cause a greater response for 2xCO2 (compare figures 4c & 4g); but the forcing is also more sensitive to a forcing that acts at the surface and lower troposphere than to a forcing which acts higher in the troposphere; this favors the solar forcing (compare figures 4a & 4e), partially offsetting the latitudinal sensitivity. In case the above comment is not clear, absorbed solar radiation is more concentrated in the tropics and a minimum at the poles, whereas CO2 is evenly distributed (a “well-mixed greenhouse gas”). So a similar average radiative change will cause a more tropical effect for solar but a more even effect for CO2. We see that the change in net flux is higher at the surface than the 2xCO2 case, and is much more concentrated in the tropics. We also see the predicted tropospheric hot spot looking pretty similar to the 2xCO2 tropospheric hot spot (see note 1). But unlike the cooler stratosphere of the 2xCO2 case, we see an unchanging stratosphere for this increase in solar irradiation. These same points can also be seen in figure 2 above (figure 4 from Hansen et al). 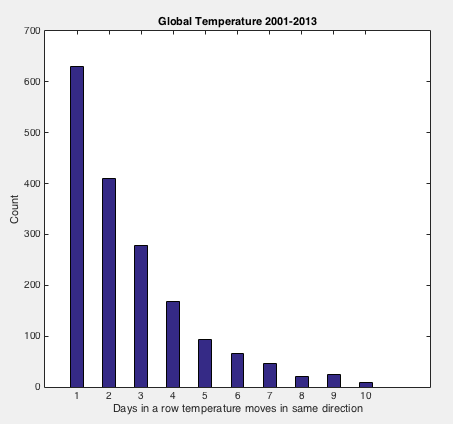 The value R (far right of table) is the ratio of the predicted temperature change from a given forcing divided by the predicted temperature change from the 2% increase in solar radiation. Now the paper also includes some ozone changes which are pretty interesting, but won’t be discussed here (unless we have questions from people who have read the paper of course). How does the climate response depend on the time and place at which a forcing is applied? The forcings considered above all have complex spatial and temporal variations. For example, the change of solar irradiance varies with time of day, season, latitude, and even longitude because of zonal variations in ground albedo and cloud cover. We would like a simpler test forcing. We define a “ghost” forcing as an arbitrary heating added to the radiative source term in the energy equation.. The forcing, in effect, appears magically from outer space at an atmospheric level, latitude range, season and time of day. Usually we choose a ghost forcing with a global and annual mean of 4 W/m², making it comparable to the 2xCO2 and +2% S0 experiments. We note that the feedback factor for the ghost forcing varies with the altitude of the forcing by about a factor of two. We also note that a substantial surface temperature response is obtained even when the forcing is located entirely within the stratosphere. Analysis of these results requires that we first quantify the effect of cloud changes. However, the results can be understood qualitatively as follows. Consider ΔTs in the case of fixed clouds. As the forcing is added to successively higher layers, there are two principal competing effects. First, as the heating moves higher, a larger fraction of the energy is radiated directly to space without warming the surface, causing ΔTs to decline as the altitude of the forcing increases. However, second, warming of a given level allows more water vapor to exist there, and at the higher levels water vapor is a particularly effective greenhouse gas. The net result is that ΔTs tends to decline with the altitude of the forcing, but it has a relative maximum near the tropopause. 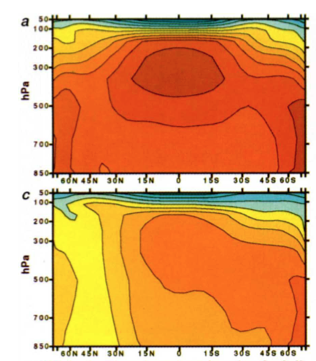 When clouds are free to change the surface temperature change depends even more on the altitude of the forcing (figure 8). The principal mechanism is that heating of a given layer tends to decrease large-scale cloud cover within that layer. 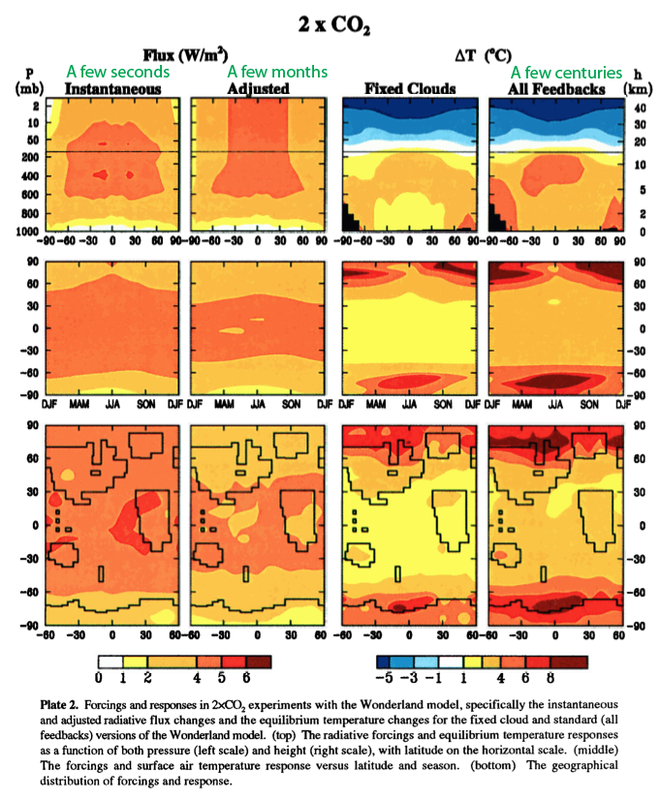 The dominant effect of decreased low-level clouds is a reduced planetary albedo, thus a warming, while the dominant effect of decreased high clouds is a reduced greenhouse effect, thus a cooling. However, the cloud cover, the cloud cover changes and the surface temperature sensitivity to changes may depend on characteristics of the forcing other than altitude, e.g. latitude, so quantitive evaluation requires detailed examination of the cloud changes (section 6). Radiative forcing is a useful concept which gives a headline idea about the imbalance in climate equilibrium caused by something like a change in “greenhouse” gas concentration. GCM calculations of temperature change over a few centuries do vary significantly with the exact nature of the forcing – primarily its vertical and geographical distribution. This means that a calculated radiative forcing of, say, 1 W/m² from two different mechanisms (e.g. ozone and CFCs) would (according to GCMs) not necessarily produce the same surface temperature change. Note 1: The reason for the predicted hot spot is more water vapor causes a lower lapse rate – which increases the temperature higher up in the troposphere relative to the surface. This change is concentrated in the tropics because the tropics are hotter and, therefore, have much more water vapor. The dry polar regions cannot get a lapse rate change from more water vapor because the effect is so small. Any increase in surface temperature is predicted to cause this same change. Many people have asked for my comment on the hot spot, but apart from putting forward an opinion I haven’t spent enough time researching this topic to understand it. From time to time I do dig in, but it seems that there are about 20 papers that need to be read to say something useful on the topic. Unfortunately many of them are heavy in stats and my interest wanes.